Today’s post is by Warren Eggleton, a reader from Australia. 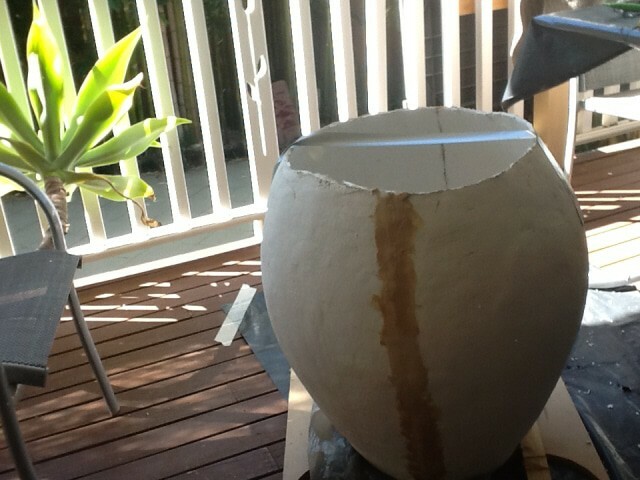 Warren has been experimenting with the idea of altering the basic paper mache clay recipe by adding Portland cement. 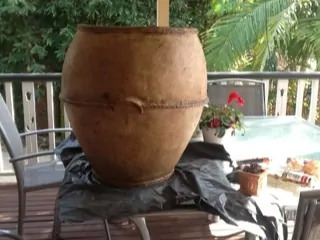 He’s making huge pots with the mixture, along with some of the original paper mache clay, and it looks really promising. You can see how he makes the pots below. This mixture is quite similar in consistency to your clay mix, not quite as good but ok. I mixed an 8 roll batch of this mix, the temp was 32c =89f, it took me 1.5 hours to get this applied to the pot armature and I just finished as it was starting to stiffen. I did one since then where the temp was down to 23c=73f and I had some left over and it was still workable after 2 hours. As we are coming into summer the next big pot that I do will be done with 2- 4 batch mixes. So depending on where you live the work time for the mix will need to be obtained first. This mix does not harden as quickly as the paper clay because the cement needs time to cure, when it does, which may take a week it is very hard and dense. I tried some acrylic instead of the PVA and found it not to be a workable as the PVA mix. Once this mix has set completely I donâ€™t think water is going to have much effect on it, though I would not immerse it in water. As far as waterproofing is concerned I did some samples using Potassium Silicate diluted 1 part to 4 parts of water. This needs to be spray applied (I used one of those kitchen spray bottles) apply a good wet coat, leave for 24 hours and then another wet coat, apply a third coat the next day, you should find that this coat takes a long tome to soak in, if after Â½ hour it is still wet wash off the surplus with water, if you donâ€™t the surface will remain slippery. For the next 3 days wet the object down with water, this causes the growth of calcium silicate crystals in the cement mix, which closes up voids in the mix creating waterproof barrier. You can also use Sodium Silicate. The Potassium Silicate I used is called Kasil from PQ Corporation. Sodium Silicate is what was commonly called Waterglass. I purchased 20L delivered from Melbourne to Sydney some 500 miles total cost $165Aus. Rather cheap considering this will make 100L when diluted. If the cement mix is to be the final finish and it is to be painted I would recommend using white cement. 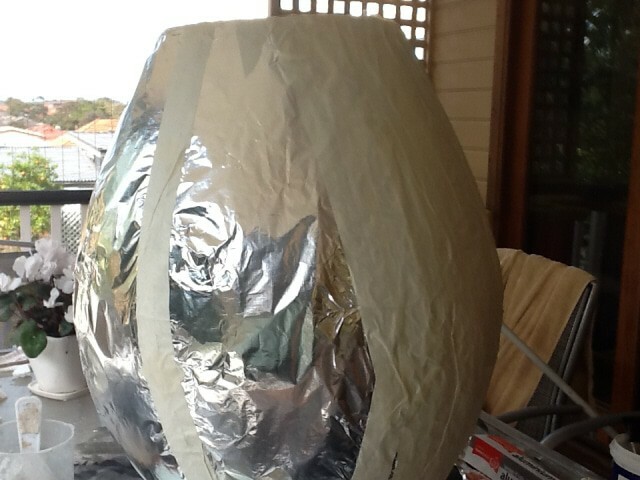 Armature covered with foil then covered with masking tape. Hello. Have ya’ ll heard of papercrete? There should be waterproofing info amongst those write ups. 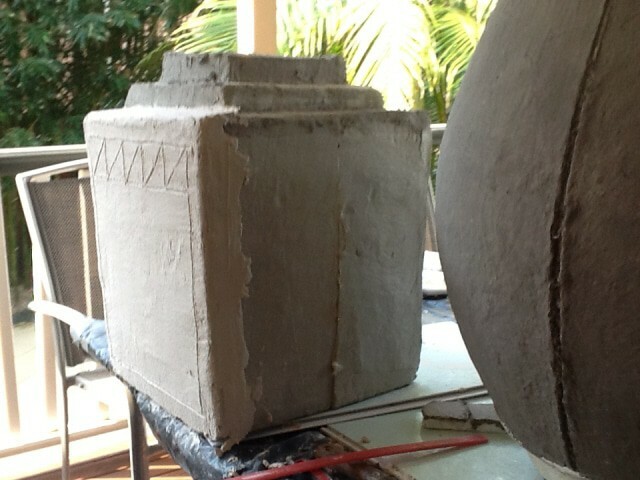 Its really amazing stuff…best wishes & hopes for awesome creations, T.
How heavy are these pots? Michelle, I don’t know if Warren is still watching for comments on his guest post. 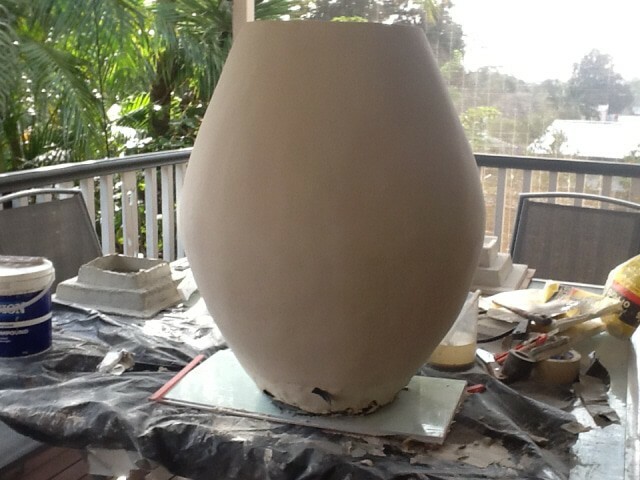 Since the pots are made with concrete and paper, and they’re quite large, I think they’re probably quite heavy. 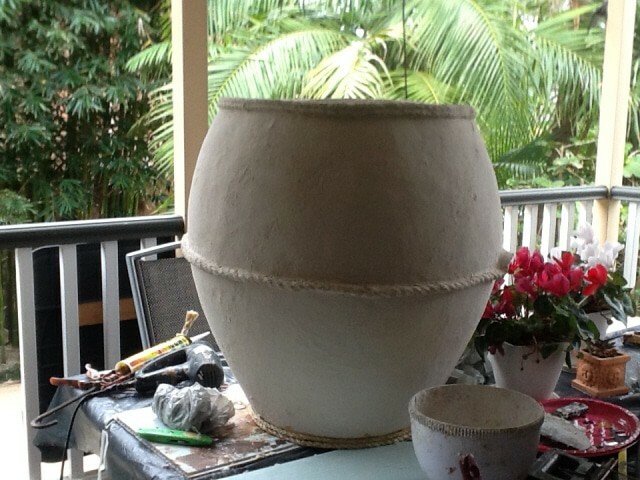 Perhaps about the same as the same sized clay pot? But that’s just a guess. Has anyone actually sculpted with this mix before? I would like to use it in that manner and have experimented on my own with concrete recipes. Some work but are tedious and some are pliable but don’t have the strength. I would like my scupture to be able to be used outside and have the pliability to do some significant sculpting and not just crude shapes. Any suggestions would be greatly appreciated. I love your pots. I am doing some props for a Beckett play called Play. 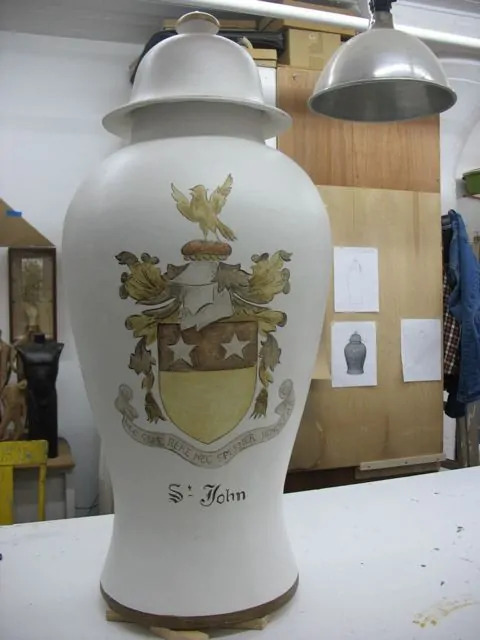 I need large urns, that an actor will look like they are in with their heads out the top. So there needs to be an opening all the way down the back so the actor can get in and out. What did you use to build the form? do you think it would be able to have an opening in the back and still be stiff enough to hold it’s shape? It doesn’t have to be super strong, just strong enough to be moved a few times on and off stage. I’m not sure if Warren is watching his post any more, so I’ll jump in with some suggestions. 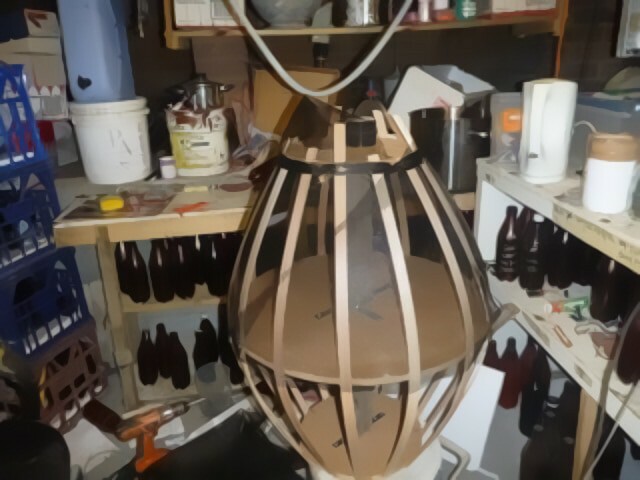 Since the form needs to be hollow, your best bet would probably using chicken wire (the vinyl covered type causes fewer injuries in my experience), and cover it with masking tape so your paper mache will stick. If you put the paper mache clay on the inside and outside of the tape-covered wire, it should hold up for your play. Just in case, you might want to run a stronger wire around the edge. 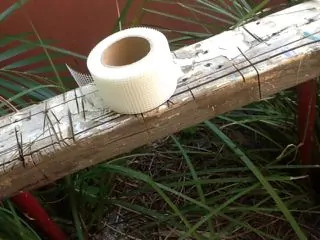 Or you could cover the form with paper strips and paste, and then make it much stronger using Dan Reeder’s method of adding a final layer using old bed sheets dipped in a solution of water and Elmer’s glue. Warren, it’s been almost a year now since you made your pots. Have they been outside all this time? If so, do they appear to be waterproof? Great work and great ideas, Warren! One thing I’m not clear about, though. When applying the mixture to the armature, what keeps it from falling into the spaces between the slats? 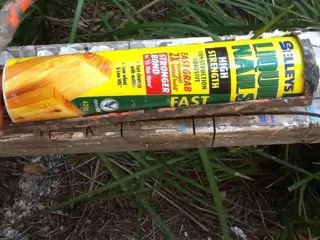 Do you wrap the armature with mesh tape before applying the cement? Thanks for sharing your ideas with us!! Just an update on the pots,the one here is one with a rust finish. The bands were done with paper clay and the rivet heads made from neat cement modified with PVA and water.I glued a marble to a stick pressed the marble into plastisene and poured the cement mix into the holes. I really like the rust-colored pot. The detailing is really nice, too. What did you use to color the pot? 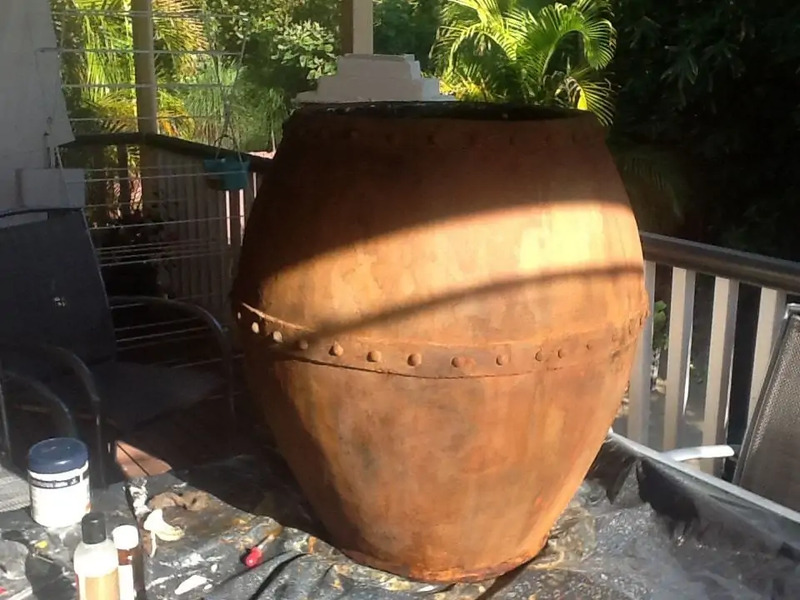 Jonni, I used iron filled rust paint and a patina, I also sprayed it with salt water and hydrogen peroxide mixture. It is real rust not a paint job. I’m afraid I am not good enough with paint to get a real rust effect. IÂ´m working with clay at the moment (old fashion way red clay cooked on a kiln) to do historical efigies, sometimes I jump into papier mache for things a bit more â€œless detailedâ€ and even sometimes I mix both as papier mache is great to add little here and there after the clay is cooked, but from time to time my soul wants more (eh eh eh) and I was thinking on a bigger scale for outdoors sculptures. I had a look on cob architecture and somehow I feel that it might not be too resistent or â€œmodelyâ€ for what I want so I thought â€œwhy not add water with cement and some dried plants with some earth?â€ â€“ we have a garden and for those who are into gardenning know how things can get sauvage out there and we have allways to cut undesirable weeds. I made some experiments : 1 portion of dried weed with dirt attached with 1 portion of cement and half portion of cement for 1 portion of the weed. The result (while wet) seemed to fulfill my expectations BUT once dried â€¦ well â€¦. I made 2 balls and 2 sort of cookie shaped, both dried ok (its still sunny here), they are very light but when I tried its resistence, it broke easily and the cement inside seemed still â€œrawâ€ (donÂ´t know the term for it) â€¦ Once IÂ´ve added water shouldnÂ´t the cement get hard as â€¦ cement?! This is a large “temple jar” which I made in layered paper, papier-mache. It was part of a custom order from an interior designer, and measures 42″ high. I have been working with papier-mache for more than 30 years, using old methods and materials that were once used for making papier-mache store displays. Large items like this jar require strong papers layered up to 1/4″ in thickness. I have been relying on my old stock of “white card-middle” and “red-flex” paper to form these large pieces. Currently trying to find a new source for these papers, and wondering if any of your readers might be able to help? Roger, why don’t you want to use the joint compound? Do you have a special project in mind? First attempt at painting round pot. Warren, the pot is really looking nice. I really like the earthenware look that you’re getting, with lots of interesting color changes. Where will your pots be sitting, when they’re done? And will you be planting something in them? Jonni, I don’t know where I will put them, I already have 6 kicking around the place. I might have to give some as presents. Some people are saying that I could sell them, don’t know much about selling things like pots. I do know that the first one I made, which I copied from one in a store was selling for $550. It was the square one i posted first, I think these rounder ones are better. I don’t think that they would take the pressure of being filled with soil, however a pot with a plant would be ok. I am working on making a stronger version that will take soil, but that might be a month or two away. As far as the colour is concerned i’m no painter it is something else like using paper macho, that I have to learn. Big THUMBS UP. I’m truly impressed. PVA is a white glue it is Poly Vinyl Acetate, Jonni calls it Elmer’s Glue, it is a glue used mainly for glueing timber. It can be found in hardware shops. I will be doing some more photos an explaining more about other products used. I will post these later today. I have a little more to add. 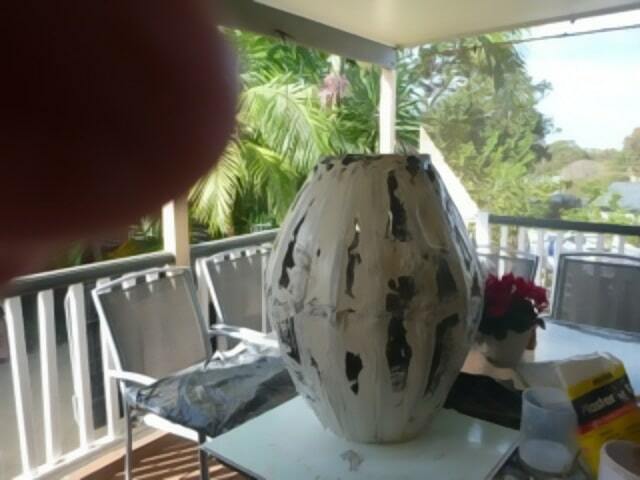 There are 3 photos below, one is a lump of cement paper mache I had left over from my first pot. I kept the lump to see how hard it would set, very hard indeed. 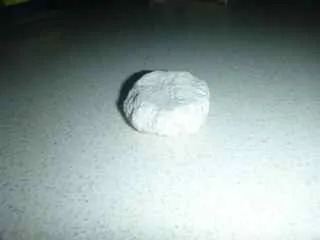 I wet this piece with Potasium SIicate on 3 consecutive days and then wet it with water fo 2days. As you will see in the photo there is water sitting in a small pool, at the time of taking this photo that pool of water had been sitting there for 1/2 hour, so I would say that it is waterproof. Another photo is the fibreglass tape I use to join the pot base together, it is tape that is used to place over joints in wall board. The third photo is the glue I use over this mesh tape to join the base. It is a wood glue commonly used for the gluing of chip board sheets to floor joists. Get the water based one not the solvent based one. I have been having trouble posting the three photos mentioned. hope this works.